Hey guys, You may have heard I was working on porting RBY music to GSC, and well, I'm sort of here for that. I want to see if we can get a team effort going to recreate Pokemon Red in Pokemon Crystal. And as a start, ALL of the music from Red is now in Crystal! Here's the deal though, I didn't get to test every song, but most of them sounded right. There was a slight glitch i had to fix in Viridian City's theme, but that's taken care of. Lavender town had a slightly different instrument, but I can fix that in the future. What the goal is, is to port/recreate maps, graphics, text, and events. I figured, why not have it be a community thing, where everyone can contribute if they want? One big thing though, is that I want to try using all the free space before we turn to overwriting actual data. That way, maybe we can still visit Johto, 3 years before GSC! What do you guys think? Sounds like a cool project! I'd be glad to help, primarily with the graphics. I already noticed, beyond porting over older tilesets, there are also block differences as well. So someone should look into the block data. I would love to help with this project, but I know didly squat about hacking GSC and I don't have much spare time other than the time i put towards Prototype. That is something I would be willing to help with, but I've looked at the notes you provided and can't make any sense of them. I don't know where I would begin if I tried picking it up. It would be hard for something like this to be a community effort, since hacking a GBC game requires careful documentation of where you insert stuff and all. Although certainly the community can help with things like how to do certain things, such as how to do map connections. To be honest, a Red/Blue remake on G/S/C is like my dream hack. It should retain all the features of G/S/C, unlike Secrets & Rumours (nothing against you, Mateo, your hack is great), it should have 2nd Gen movesets, breeding, day/night, everything awesome that G/S/C introduced, but it should NOT have G/S/C music, it should have original R/B/Y music to accurately represent the feel of Kanto. By the way, FroggestSpirit, how did you port all of the R/B/Y songs to Gold? I've always wanted to make a hack of Gold that restores all the correct Kanto music, kind of like what HG/SS did. cool!i dont know what help can i offer since im very busy right now,and even sir arceus' project isnt totally finished by me. Danny, I guess I'd even be a little lost if I jumped back into Red in color x.x i was running out of room anyways. But to answer the questions, yes, I'd like to keep the gen 2 things in, including: Breeding, movesets, 251 pokemon etc. What I might take out is the pokegear... or maybe have it available after beating the game and going to johto. The music was converted by a converter I wrote, but will not be released because 1: it only converts RBY to GSC (all the songs are done aside from pokemon healing) and 2: I still had to touch up a lot of them by hand. Johto, I think would be a cool bonus, go through, get the 8 johto badges, but not much story there. But the primary Idea here, is to remake red. As for the community effort, we might be able to provide some self written documentation, and where it is inserted. If I make a thread in the hack section, I will contain a spot that has all the free space listed, so that way we can divide it up, and know where we can stick stuff. Edit: Almost forgot, about the block data differences, If we can insert tilesets for RBY, and block data for it, I think I could do a simple converter to take care of the rest. Though events, people, etc might need to be manually done. I think this is a cool idea, and I'm not bothered by it at all. They really are two separate (if similar) ideas, and appeal to different interests. No worries! Alright, I'm glad to hear that :) and like I said, If you want to use the music ports in SaR, the pointers to music start at xE9071, and are 3 bytes a song, and the songs are in x1C4000 - x1D0000. You don't have to credit me, as the music is not my property lol. Anyways, let's get the ball rolling, and figure out who wants to help, and who can do what. I'll probably start a thread in the hacks section to get this organized after we figure out who wants to help. And it's not to early to start doing stuff. The current version is in the first post, so if you want to add on to it, graphics, maps, etc, just do that, and include a text file stating what was added/changed, and where in the rom. I started working on inserting block data of outside areas to the rom. I'm really shocked at how many routes were shrunk! To be safe, Any area with block data that was larger in RBY, get's a nice home starting at 0x1D0000. I'm nearly done with all the routes, but then map connections, and warps, etc will need to be fixed. Thanks! :) Is anyone here really good with map connections? me as well,i dont have much to share but im thinking of being a beta tester,?if permitted?but im too early for such suggestion...btw,those devamps were cool!looking forward to see more devamp graphics! I tend to get map connections running properly every time I need to edit them but I don't feel like fixing map connections for some other hack. After all, it's not a "piece of cake" type of a job. Takes time and can be sometimes a bit annoying too. If you need help with them, I'll be here for you though. You could start off by reading that incomplete tutorial I've written in Gen II section about map connections. It's lacking several things but you should be able to figure them out by experimenting and seeing how the originally built-in connections work. I don't understand the "Bigness" part (I think it's width in Johto Map) because Pewter is a height of 18, but maps connecting to it give it a height of 16. When it connects to routes north or south, it gives a height of 10. If I remember right, Width in Johtomap stands for the width of the connected map. Height then again should be the "Bigness" value. That "Bigness" there determines the width of the connection in the connected map (in blocks) I think. I still don't know how it got 16, when Pewter has a width of 20, height of 16, and route 2 has a width of 10, height of 27 (in the RBY map im using). Anyways, working on the program... it opens the rom, you give it the bank and map number of 2 maps, it asks what side to connect it to. Right now it does nothing, but it is successfully reading the data it needs, like height, width, the connection data, etc. It wont be hard to just have it write it all, but the program is meant to be used alongside JohtoMap, where you can see the bank and map numbers, and the connections (it only asks where you want to connect it, if it's an available connection). Seems interesting I suppose, might be better to work off of my hack though as I practically fixed many things that would take hours for you to do, like make the native pokemon in Kanto apeear correctly and some of the scripts are already created. Though I admit, need a bit of tweaking. But it would be cool if you could implement the kanto songs into the hack because that was planned when I was orginally working on it. Just to throw that in there, I also took the liberty of revamping many tilesets already like Pokemon Tower. FrggestSpirit, I'd like to talk to you more about this. Got Skype? I already used the tutorial for all the other map connection stuff. It's just CSUBP that has me baffled... or does it? I might have it somewhat correct. I'm not sure though, because I already got every map (outdoors) from RBY in, and connected (minus the CSUBP) although... maybe it could work to fuse the two... because adding the music is basically just copy and paste about 2 banks worth of data and the pointers. I don't really use skype... any alternatives? FroggestSpirit, it wouldn't be wise to do any more connections or anything until I'm done with what I'm doing. After I'm finished I'll upload and you can finish the connections. 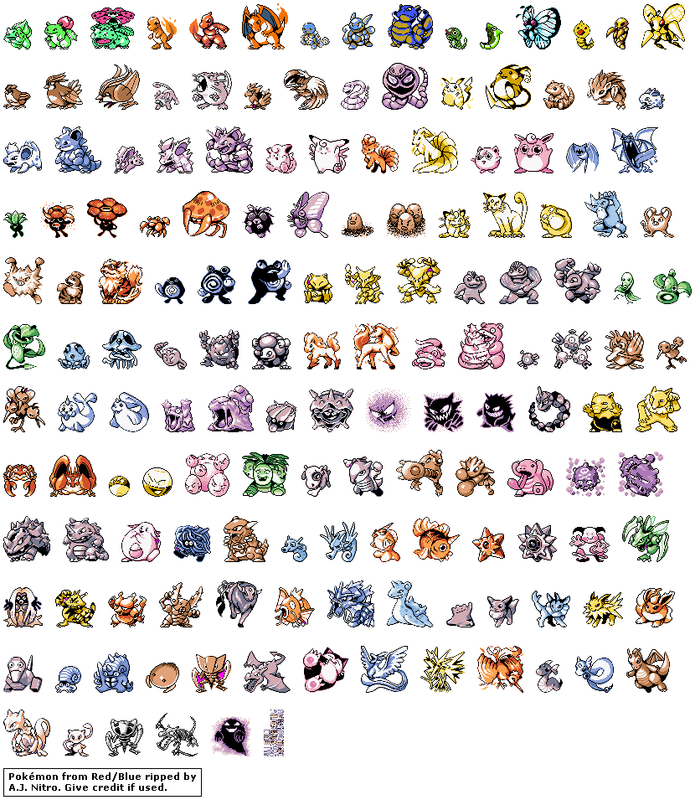 Please use the Pokemon sprites from G/S/C, not the ugly Red/Blue ones, because if you change them to the Red/Blue sprites, it kinda ruins the whole point of remaking it on Gold/Silver in the first place. I'm really pumped for this, too bad I can't really help. I agree, I can't begin to tell you how annoying it is to find out you messed up somewhere and having to edit and extend the events...I've been down that grueling road for so long. But we should have enough space if we pull that off. In addition to what we talked about yesterday in regards to leaving Johto intact, now I remember why I overwrote Johto's data in the first place. If we start in Kanto, the map data will be out of wack because you haven't beaten the Pokemon League. There must be a flag somewhere but no one knows what the flag is, so it became more convenient to overwrite or rather, extend Jotho's data. Because if I recall, Johto has a ton more space to use then Kanto does. (plus there isn't enough space for adding wild data and map data for the new areas were "reinserting" like Pokemon Tower). And oh :/ connections are a bummer, but I like what you did with the maps, looks great. I don't think we are gonna use the older ones.